The Easiest Affiliate Management System for WooCommerce and WordPress is here!! 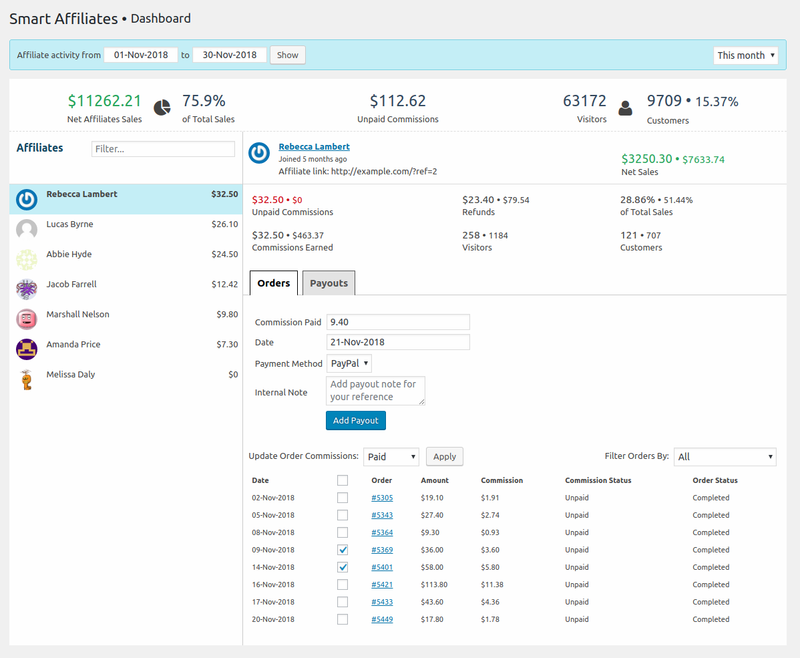 track Affiliate Sales, Referrals, Commissions, Record Payouts and much more – all from a single screen interface. Yes, poor sales copy, fluff material and lack of visibility gives poor conversions. But then why a great marketing copy and popularity doesn’t convert? The answer is the trust factor. Now, the fluff copy and hype which sellers bombard on their audiences to buy their products have made them extra careful and cautious. In-spite of you writing a genuine copy and adotping a straight to the point approach, it’s difficult to convince majority of your visitors to buy. So… whom they trust? Their friends???…. Absolutely!!! People trust more to what others say about you rather than you telling them about your products, brand, service, etc. Your own customers, friends, collegaues…can easily promote your brand to a large audience. The best part, we have a solution for that – Affiliate For WooCommerce! Using Affiliate For WooCommerce plugin, you can easily create and share exclusive affiliate link of your store with your affiliates (partners) wherein, users can purchase your products through these affiliates. 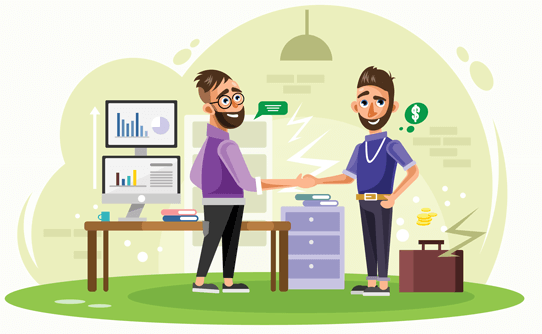 Whenever a visitor buys a product from your affiliates store or site, your affiliates get a commission as a thank you token and you get your money. Thus, these affiliates indirectly promote your products in their circle giving your products a more global outreach. That’s the reason why word-of-mouth/reviews/recommendations are so powerful. The end result, you pocket in more and more sales and customers, as well as your WooCommerce store, becomes more visible than ever before! You gain more success and so your customers. You are indirectly strengthening your customer relationship. A win-win situation for both. What Makes Affiliate For WooCommerce The Best WooCommerce Affiliate Plugin? What sets Affiliate for WooCommerce different from its competitors – AffiliateWP, Affiliates Pro, YITH WooCommerce Affiliates and other is its simple, single screen intuitive dashboard. You can track all at a single place – commissions, order status, products sold, affiliate partners, etc. You no longer have to struggle with different screens and menus to track affiliates, referrals, and payouts. Everything is available in one single dashboard. No jargons. All the important key performance indicators available at a glance. Not only does Affiliate For WooCommerce plugin automatically link WooCommerce orders with affiliates, it also updates commission status as order status changes. Pending to Completed, Completed to Refunded… You don’t need to lift a finger. Commission status will be sync’d with WooCommerce order status automatically. There is no limitation to the number of affiliates and the affiliate traffic. Track it all! Affiliate For WooCommerce provides easy and quick migration from popular WordPress Affiliates plugin. Click a button and all your data from Affiliates plugin will be imported to Affiliate For WooCommerce. No short codes. No complex procedures to be followed. All you need to do is set this plugin on your WP site, fill up a few setting details and you are ready to roll. An important part of any business online is awesome customer support. And you’ll get it! Sit back, grab a cup of coffee, relax! Affiliate For WooCommerce will take care of all calculations, commissions, order status, etc. You just have to monitor your money scoreboard that will keep increasing!